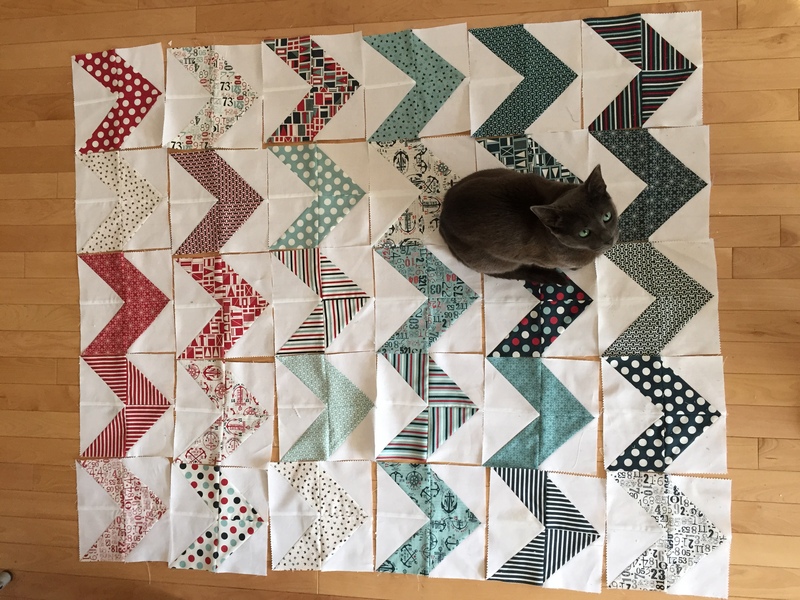 Since everyone is having babies these days I’m making lots of quilts! I made this quilt for one of my besties who lives in Germany. 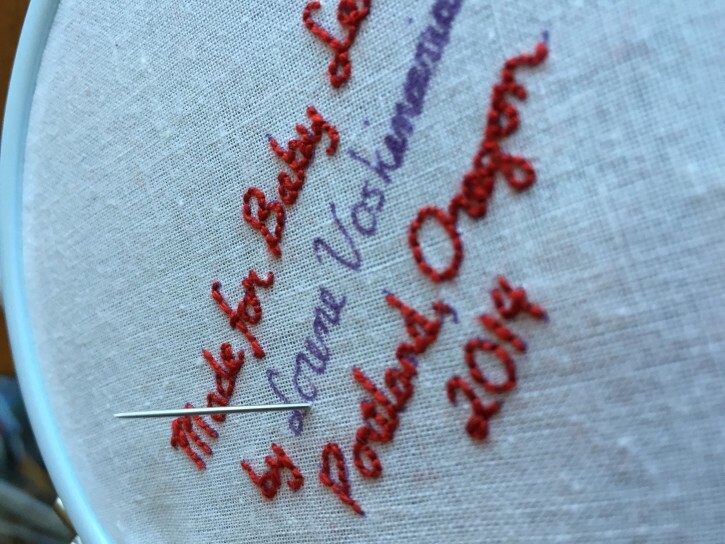 I wanted to get it done before Christmas so I could pass it along to her mother to deliver it for me. 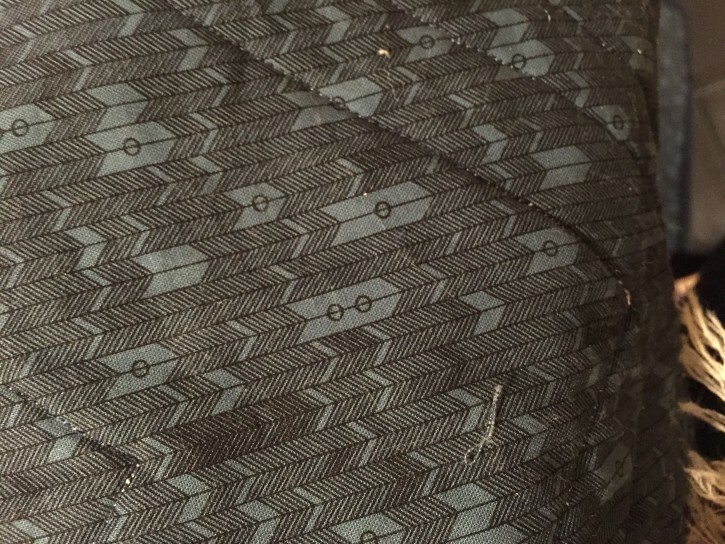 The last quilt I had to ship to Europe cost $50 to mail! Almost done hand sewing the binding on! 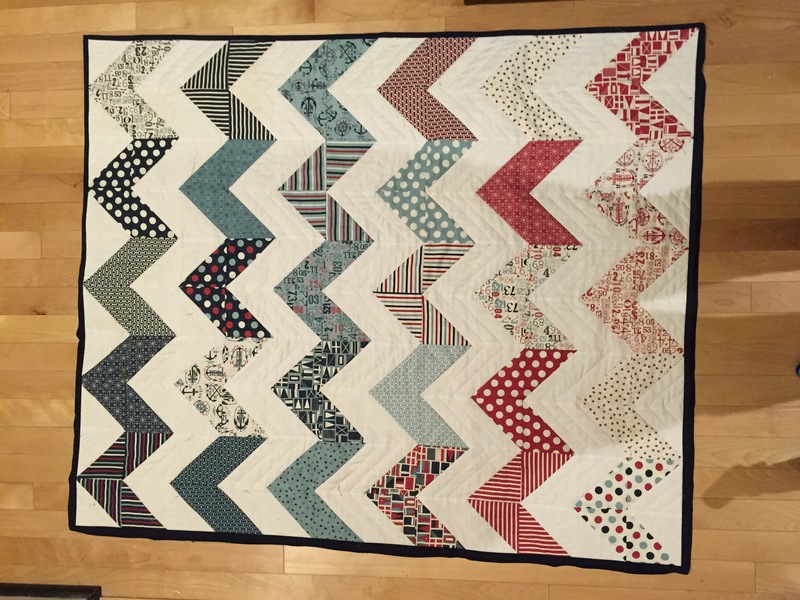 Making a chevron quilt has been on my to do list for awhile and I really like the ones with white stripes. So all I had to do was find some fabric. Since I’m lazy I went for a charm pack. I knew it was a boy but I dislike things that very gender specific, so I ended up buying The Boat House by Sweetwater for Moda. I needed 2 charm packs because the chevron blocks required 2 squares. I was also super lazy and got a Kona white charm block. Yay for precuts! Chevron blocks are super easy to make. It’s just a bunch of half-square triangles. Although if I made another I’d definitely invest in one of these nifty Half Square Triangle Rulers, that my sister Natalie only told me about when I was almost done. For my block layout I was trying to get an ombre effect as from red to navy. My cat Magi was super helpful in figuring this out. Is it too late to shorten my last name to Vosky? I totally forget what the name of this fabric is, but the lady at Modern Domestic was brilliant in suggesting this. I had something totally different in mind when she pulled this one out and I instantly knew it was perfect. 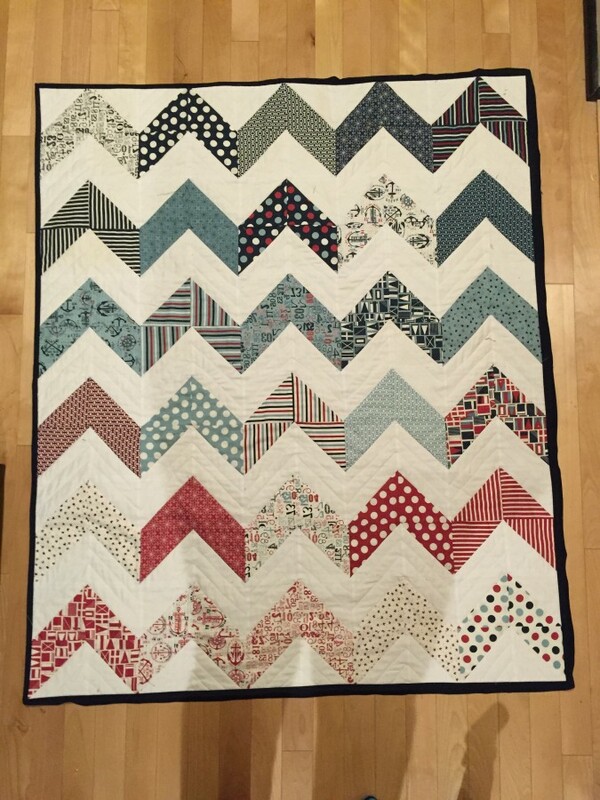 The design and colors totally complement the quilt front. I forget your name but thanks! 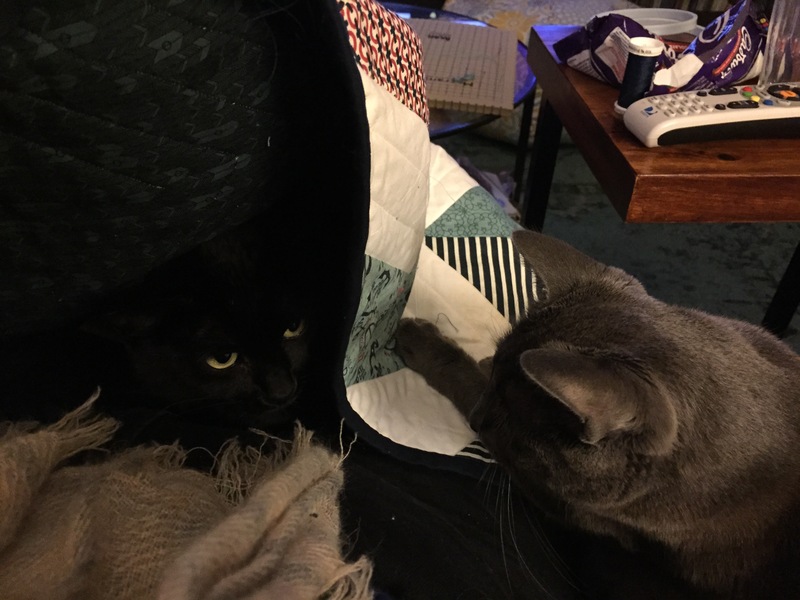 My other cat, Cleo, was also very helpful in the making of this quilt. Her she’s keeping my lap warm while I hand sew the binding. On a side note, Cleo loves hanging out under blankets. Every morning she greets me by trying snuggle up under the comforter. It’s adorable.